Has anyone ever noticed that with new seasons come new opportunities, specially in the job market? Now that Spring in imminent, a lot of my friends have been either in the interview process of getting new jobs or looking for a promotion in the jobs they have now. In both cases, everyone has had to step up their game in the "proving themselves" department. For those being interviewed, they've had to think of questions they might be asked as well as questions they should ask their potential employers. For those looking for promotions, working overtime has become a priority as well as coming up with new and innovative ideas for improving their work environments. Now, this is how this post is going to tie into these situations. For those being interviewed, a potential question that might be asked could be similar to this post's quote: what moment in your life stands out and how could it be applied to this job if hired (SAT-like, I know, but one of my friends was actually asked this question)? Pulling out a Miss Universe-type of answer was required, but hearing this story made me think of moments that stood out in my life such as travels, birthdays, meeting new people, and even deaths in the family. Not to sound corny, but a very memorable moment in my life was when I decided to start this blog! It's helped me develop myself in the kitchen as well as in self-expression, but I'll leave that for another post. Back to the topic at hand. For those looking for promotions, since working extra hours has become a part of their daily routine, time for actual cooking has been greatly diminished if not extinct. This recipe, as I already recommended to one of my friends with a hectic schedule, takes at most 10 minutes to make and can be made as dinner and then packed as lunch for the next day (by adding rice or any kind of side to accompany these meatballs). I think this recipe would even be interesting to Sandra Lee from Food Network since it's "Semi-Homemade!" I know, cranberry automatically sets off an autumnal bell in your minds, but trust me, the flavor combination that's achieved from the barbecue sauce and ketchup make this a perfect meal for throughout the whole year. 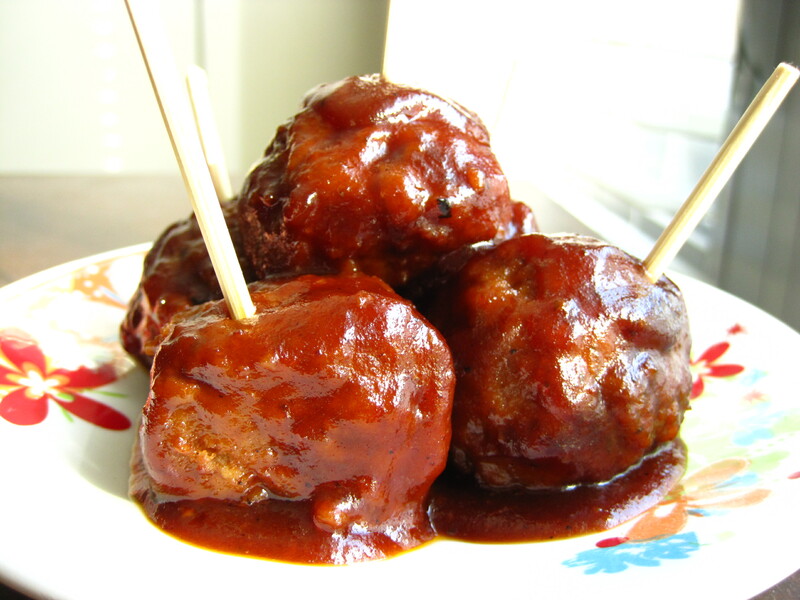 Also, if you stick a toothpick in each meatball, they can be served up at dinner parties or brunches as a nice appetizer for all of your guests. Although I stuck to adapting the main recipe for this post, two variations were included in the book so feel free to try them out! I'll be adding them at the bottom of this post if you're curious. 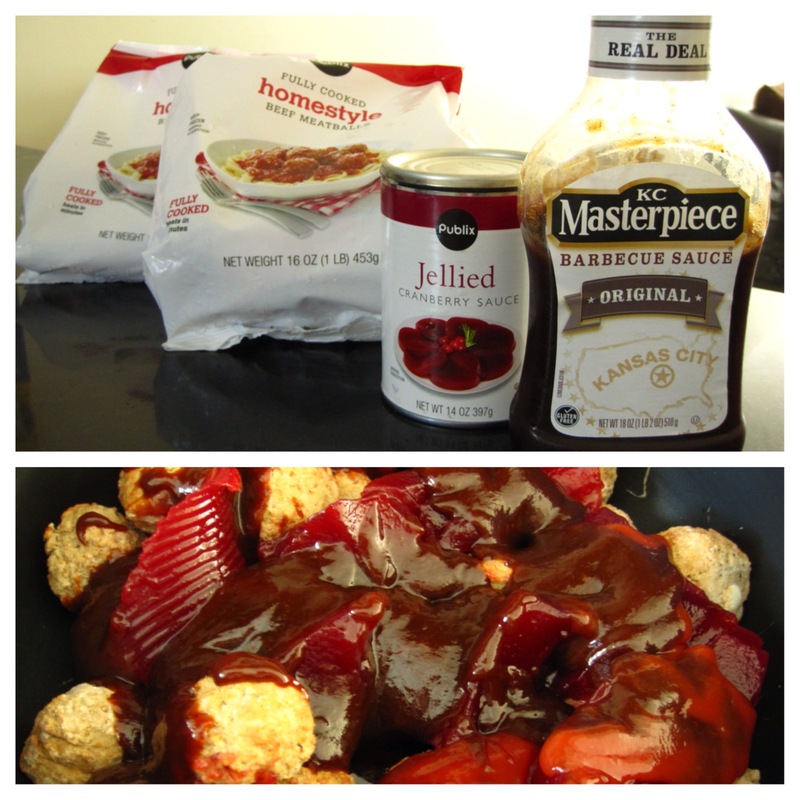 1) In a large saucepan combine thawed meatballs, cranberry sauce, barbecue sauce, and ketchup. Heat to boiling; reduce heat. Simmer, uncovered, for 10 to 15 minutes or until heated through, stirring mixture occasionally.